Ebenezer Scrooge, a miserly debt collector in 19th century London, is something of a git. He shuns all those around him, choosing to spend Christmas alone instead of with his nephew, his only living relative. He is cruel to his clients and staff, rude to charity collectors and has no qualms with ordering people to be locked up and their furniture repossessed on Christmas Eve. Oh, and he pours a bucket of cold water onto Tiny Tim, a sickly carol singer, who also happens to be the son of Scrooge’s secretary, Bob Cratchit. After finishing work on Christmas Eve, Scrooge is visited by the spirit of his former business partner, Jacob Marley, who warns him that he will be visited by three more ghosts before the morning, in the hope that Scrooge will change his miserly ways and live a better life, or face the same fate as Marley. A Christmas Carol may well be the most adapted story ever made, though this is probably the first predominantly straight adaptation I’ve seen, with the only other versions I’ve dabbled in starring the Muppets, Edmund Blackadder, Doctor Who and Bill Murray. There have definitely been some modifications made to the story in this instance, as glossed over by Charles Dickens (Simon Callow) reading the story to a packed theatre in the live action bookends to the film. 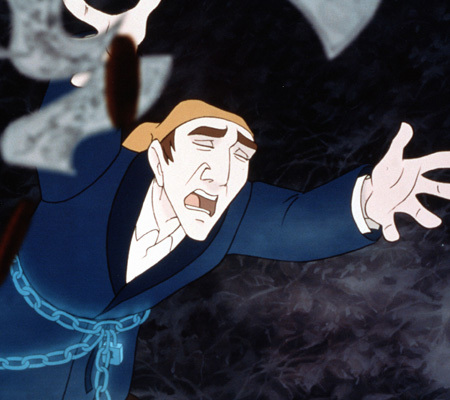 Once he has begun, the film becomes animated for the main story, with Callow now voicing Scrooge. Kate Winslet voices Belle, a nurse at the local orphanage and a figure from Scrooge’s past (which I think was supposed to be a surprise, but isn’t), Rhys Ifans is wasted as Bob Cratchit and, in a casting coup that should have got somebody a promotion, Nicolas Cage plays the ghost of Marley. Yep, Nic Cage packed this in between Captain Corelli’s Mandolin and Windtalkers, adding to his far from impressive early 2000s output. Because I’m sad to say that I just didn’t get on with this film. The animation style is crude and rudimentary, clearly attempting to emanate the early hand-drawn animation of director Jimmy T. Murakami’s earlier works such as The Snowman, but it just comes off as sub-Disney. And the CGI mouse in the live action segments is terrible, even for 11 years ago. I’m a fan of Simon Callow, and he’s a good choice for Dickens (he reprised the role twice more in various seasons of Doctor Who) but he’s no comparison to Michael Caine, Rowan Atkinson or Bill Murray. The rest of the cast don’t really get an awful lot to do, and many of the more famous voices are unrecognisable, such as Jane Horrocks, Michael Gambon and Robert Llewellyn. Clearly, this film wasn’t made for me, it has a younger audience in mind, hence why in almost every scenes there’s a couple of mice squabbling over food and trying to save the day by showing Scrooge a letter delivered by Belle. I’m pretty sure thee rodents weren’t in the original tale, and I have no problem with them here. As far as I’m concerned, for a child this film would be nothing more than mildly diverting, as more often than not there isn’t a great deal going on that would keep a younger mind engaged, even for the 77 minute running time. There are some sequences that could even be downright disturbing – the anthropomorphisation of ignorance is a child whose skin tightens over his skull, then cracks and disintegrates, crumbling into a pile of dust – and the ghost of Christmas Future is a little offputting, but not as much as in The Muppet Christmas Carol, from which this version clearly took a great deal f inspiration when designing the spirits. As adaptations go it isn’t terrible, and all the familiar beats are hit, most prominently the image of Scrooge flying in his nightshirt, cap and slippers, but there are so many better variations of this story that you could see. This is really only for Cage or Winslet completists only. This entry was posted in 04/10, Choose Life, Film-Makers, Kate Winslet, Review and tagged Christmas Carol, Jane Horrocks, Jimmy T. Murakami, Kate Winslet, Michael Gambon, Nicolas Cage, Rhys Ifans, Robert Llewellyn, Simon Callow by jaycluitt. Bookmark the permalink.